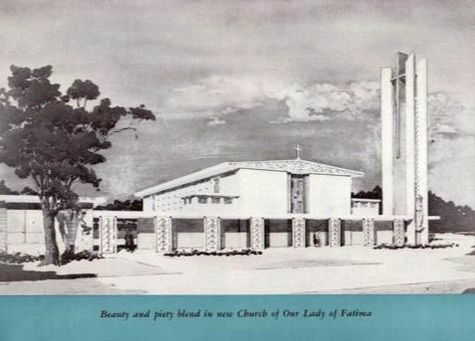 ​GIFTS TO THE BUILDING FUND of Our Lady of Fatima Church may be applied to the creation of Memorials to departed loved ones. 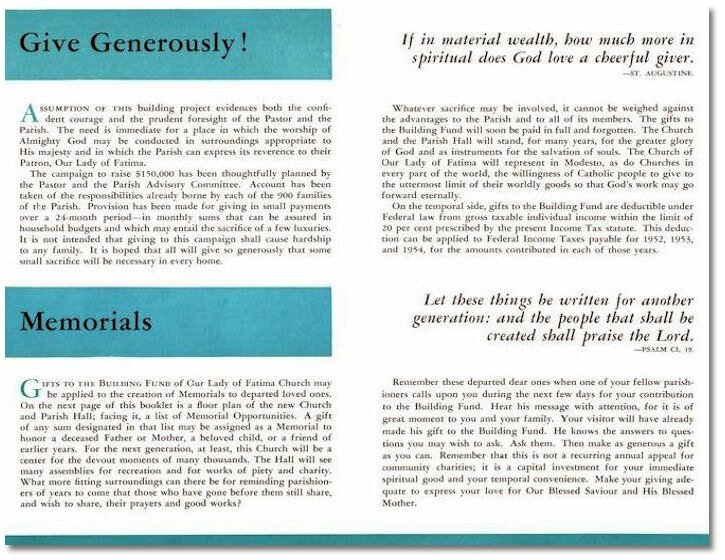 On the next page of this booklet is a floor plan of the new Church and Parish Hall; facing it, a list of Memorial Opportunities. A gift of any sum designated in that list may be assigned as a Memorial to honor a deceased Father or Mother, a beloved child, or a friend of earlier years. For the next generation, at least, this Church will be a center for the devout moments of many thousands. The Hall will see many assemblies for recreation and for works of piety and charity. What more fitting surroundings can there be for reminding parishioners of years to come that those who have gone before them still share, and wish to share, their prayers and good works? Remember these departed dear ones when one of your fellow parishioners calls upon you during the next few days for your contribution to the Building Fund. Hear his message with attention, for it is of great moment to you and your family. Your visitor will have already made his gift to the Building Fund. He knows the answers to questions you may wish to ask. Ask them. Then make as generous a gift as you can. Remember that this is not a recurring annual appeal for community charities; it is a capital investment for your immediate spiritual good and your temporal convenience. Make your giving adequate to express your love for Our Blessed Saviour and His Blessed Mother.